If you are new to mountain bikes and thinking about buying your first bike, you are in for a surprise. There are a lot of different types on the market and a lot of different sizes. It can be a little confusing. Here is a look at the main types available to help you make the right choice. You will be faced with questions immediately. Do I need a hardtail or should I get full suspension? What is the best wheel size for me? What about frame types and what about components? 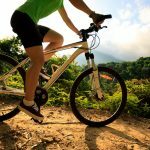 Essentially, there are two main types of mountain bikes. There are the hardtail types and the full suspension types. Hardtails are call as such because they only have suspension on the front forks. The full suspension type also has a shock absorber at the rear, which is designed to keep the bike stable and under your control when riding on the toughest of trails. Full suspension bikes are often more expensive because of the added engineering. They are really designed for those who plan to take on the most extreme conditions. That being the case, you can probably settle for a hardtail as your first bike because you shouldn’t really be trying to take on such extreme trails until you have more experience under your belt. As mentioned, these bikes are heavier and have suspension in the rear and in the forks. It’s normal to have around 100mm of travel in the rear suspension with 120-140mm travel in the forks. Even though they are slightly heavier than hardtail, they are great for extra control. Full suspension mountain bikes also offer a subtype also called “all-mountain bikes” or Enduro mountain bikes. These are heavier again and smoother to ride on very tough terrain. Downhill full suspension bikes are the other main subtype of full suspension type mountain bikes are a specifically designed for riding downhill and often not very good at going uphill – you can cross this type off your list for sure. Hardtail mountain bikes are the most popular because they are great for just about all kinds of mountain biking. They are also much lighter, faster and more nimble than the full suspension types. They are definitely much more responsive than full suspension bikes, especially when you are a beginner. Hardtail mountain bikes also fall into two categories. There is cross country type which is good for trails where you will be going up as much as you will be going down. Most have 80-120mm of travel (in the forks). Trail riding hardtail are generally a little heavier and have a little less travel in the forks. They are designed for riding trails. The reduced travel in the forks helps to reduce vibrations coming through the front wheel so you have more control on the trails – a good option if you are intending to ride trails rather than cover uncharted ground. 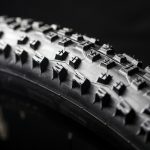 There are numerous options when it comes to gear rations available across all mountain bikes, starting at one through to two and three chain rings. More chainrings give you more options but also mean higher maintenance levels. The best option for beginners is a double chainring setup. The traditional wheel size for mountain bikes is the 26 inch and gives a lot of maneuverability. The 29 inch is a much bigger wheel and will take some getting used to. The 27.5, a newer introduction, is often considered a good choice because it gives a smoother ride than the 26 without being a big and as slow as the 29 inch. The 27.5 inch wheel is a good start for any adult. Generally speaking, there are three main frame types. Steel frames are strong but are slightly heavy while being extremely durable. Aluminium is not quite as durable as steel but will not rust and has become extremely popular among mountain bikers. Even as a beginner, I would go with an aluminium frame. For the ultimate, and definitely not necessary for the beginner, carbon frames are extremely lightweight and even stronger than steel. Unfortunately, they cost a fortune. As always, the final issue will be a matter of cost. A bike as recommended in this article won’t be the cheapest, but that is probably not what you want, even as a beginner. I remember getting my first steel-framed BMX as a kid. It was a struggle and all I wanted was an aluminium frame because the steel frame was just so heavy and hard to even the smallest bunny-hop. Even a beginner, it worth having the bike that allows you to learn and not the cheapest, and that goes for kids who are pretty serious about following up on their new hobby. Is there anything you can add to this article? Please share your thoughts through the comments section below.